« No AA filter for future Sony models? Sony aims for the sky – RX1? According to Sonyalpharumours, on Wednesday Sony will not only announce the Alpha 99 full frame SLT, but will reveal a compact bodied full frame fixed lens model with the same 24 megapixel sensor, called the RX1 and taking the concept of the RX100 zoom ‘one inch’ format model to a new height (photo – from Sonyalpharumours). It’s a retro-appeal camera, with a mode dial, an over-ride dial, lens apertures set round the lens, a conventional hot shoe and a a manual focus ring which doubles as a fast means to switch between two AF ranges, 20-35cm and 35cm to infinity. It has no viewfinder, just a fixed positon rear screen, but apparently will have EVF and optical finder attachments. Inside Sony, I think there’s been some serious divisional competition between the former Minolta Alpha group and the more powerfully connected Cyber-shot team. All the indicators are that sometime earlier this year the two divisions were put into a competing situation and there may ultimately be one winner, one loser. That’s how Sony culture is structured, according to every insider view I have heard since Sony acquired the Minolta camera brand in 2006. Groups, departments, teams and individuals are weighed against each other as well as against their industry rivals. The winners are rewarded with promotion and bigger budgets, the losers have to survive with diminished resources. It’s a deliberately competitive environment. I believe the Cyber-shot team got hold of this sensor to compete head-on with the NEX team. This is part of Sony’s internal camera design Olympics and only Gold counts. The RX100 has been a sell-out success and given the division the authority to take Cyber-shot models to places where the DSC-R1 was once heading before Alpha and NEX arrived on the scene and shut that line of development down. They kept the RX100 under wraps to spring it on the world – including other Sony camera teams – as a blockbuster surprise. Now they have done the same with the RX1. Where next? But, will a camera like this sell? Did it ever sell in the era of film – and why should anything be different today, give or take temporary fashions for the limitations of retro-style specifications? In fact there were plenty of cameras with lens specifications around 35mm f/2 over the years, but very few survived after zoom lens compacts arrived. The era of Hi-Matics, Canonets, Yashica or Ricoh 35s saw apertures up to f/1.7 and focal lengths ranging from 35mm to 45mm. By the time 20 years of zoom lens SLRs and 10 years of zoom compacts had destroyed that market, it had moved in favour of boutique level pocktables like the Contax T2, retro Rollei 35, Minox 35 and their copies. The 35mm focal length won the day in the smaller bodies, but f/2.8 replaced faster apertures to keep size and weight down. Minolta broke away with the titanium-bodied TC-1, one of the most expensive such cameras ever made. It had a 28mm f/3.5 G-series lens designed with a large rear element and a concave front surface, using new aspherical technology. Instead of a variable aperture, it used perfectly round laser cut Waterhouse stops which eliminated diffraction effects. This proved a valuable precursor to digital camera lenses later on, needing the same technology for ultra-short focal lengths and small sensors. But it was left to Konica reintroduce the rangefinder-style body with a fixed 35mm f/2 lens, in the form of the Hexar 35, another very expensive and beautifully made design. The Hexar was the fin-de-siècle failure that bad design detail ensured it would be. No-one wanted a leaf shutter camera – even one with a near-silent slow winding mode for filmset and concert shooting – that was limited to 1/250th top shutter speed. Leaf shutters were perfect for synchro-sun flash, but plenty of focal plane shutters could do 1/250th. If the camera had been equipped with a 1/500th or 1/1000th top speed its hybrid electronic control system and Aperture Priority basis would still have missed the mark. Konica went on to show a full Hexar RF Leica M mount system at photokina 2002, finishing it off with some revolutionary additions at the same event in 2004, by which time Minolta and Konica had merged. Within days of the close of photokina, the Hexar 35 and the RF system were discontinued. Whatever feedback they had received, the merged Konica Minolta dropped the Konica brand and with it the highest end Konica cameras. The fact was they had not sold, and had not sold profitably. Which could be why the Cyber-shot division is aiming for the sky with the RX1, and pricing it at a rumoured $2799. That’s over £2,000 in British money with VAT, for a fixed lens camera – even though it will shoot 5fps, 24 megapixels, and has a Zeiss Sonnar lens. It may also be the first time a Sonnar has covered this angle at f/2, previous incarnations have either been f/2.8 at 63° coverage or been longer relative focal lengths at f/2 (I stand to be corrected on this – the Contax G system used a 35mm f/2 Planar). To that $2799 you can add a viewfinder and possibly other accessories. This is one camera for which I would expect to see both 0.7X wide angle and 1.5X tele lens converters (24.5mm and 52.5mm equivalents). Combined with intelligent cropping and resampling, the 24 megapixel full frame should also offer 1.4 or 1.5X and 2X digital tele, or perhaps a variable digital zoom, and a likely 3X/2X/1.4X range of video crops. Then again, Sony may be playing very clean and avoiding these options even if they would improve the experience of a fixed 35mm lens for many users. I have to say that at this point, Sony has left me behind. It’s neat focal length in the Leica system because it’s been around in optically acceptable form and fast maximum apertures since the 1960s. The classic lens sets for 35mm full frame started with the 35/50/85-90mm trio. This was because so many rangefinder cameras used interlens shutters and interchangeable front groups rather than entire lens in front of focal plane shutters. Anything shorter than 35mm was expensive and huge, anything longer than 90mm couldn’t be focused very reliably. So we ended up with launches like the Leica CL – just a 40mm and 90mm lens pair. But Leica had moved on long before in the M-series, starting with the M2 (35mm widest lens) alongside the M3 (50mm, anything wider needing ‘spectacles’ or a separate finder), then the M4-P which for the first time put 28mm on board. So the Minolta CLE Leica-mount kit appeared with 28/40/90mm as its kit, and fifteen years later the Contax G system came with 28/45/90 as an alternative to the more affordable 35/90. 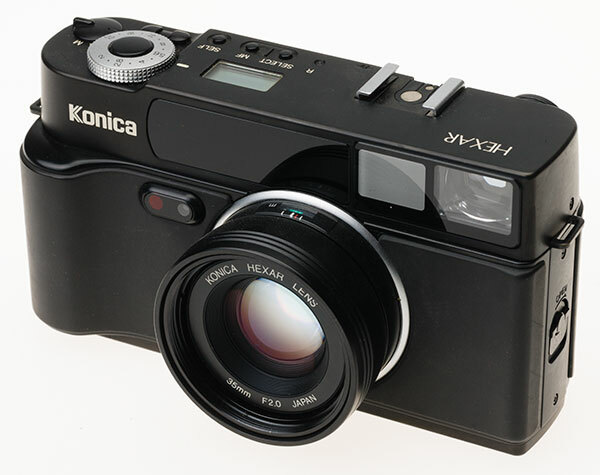 Konica offered their RF straight out with a 28/50/90mm set. Fuji’s XPro-1 has been a success, and its launch lens set is 27/52.5/90mm. Now there’s a big gap from 18mm to 35mm (actual focal lengths) and they will fill it with a 35mm-equivalent. But would you want that on its own? I know someone who has a Leica M9 with just a 35mm f/2. That was a budget decision. Given enough money they would have the 24mm, 28mm, 50mm, 75mm and 90mm too! Well-mannered and perfect though it has every chance of being, a 35mm f/2 on full frame is as uninspiring for me as the Fujfilm X100’s fixed 23mm f/2 on APS-C was. It’s a good focal length for small groups indoors, general house and garden shots, and street candids. It’s too short for conventional portraiture and too long for environmental editorial people pix. It’s easy to use and fairly boring. Most of all, it is extremely easy to MAKE. The history of photo gear is one where lenses with a 60-65° angle of view have been good. Unlike early 28mms, 35mms were OK. The same angle of view on any compact digital, of any sensor size, is still good and many are f/2, even if they don’t offer the same lazy solution to defining the centre of interest in a shot. I do not need to spend $2799 to get what the RX1 appears to offer. I didn’t even want it in the NEX-7 and have never felt tempted to buy the 24mm f/2. I think, perhaps, that after a long time of ignoring photographers Sony finally listened. They may have listened to the wrong ones. The lens enthusiasts of dPreview represent a tiny minority. Those who will spend nearly $3k on a fixed lens compact – even with full frame – are even fewer. Now, when do I get to apply for a job selling it into China? There is one place with new buying habits to match this camera perfectly! 2 comments to Sony aims for the sky – RX1?